After 38 years of service, Suzanne Ferimer, librarian for the College of Optometry, is retiring from the University of Houston. Ferimer has been a health science librarian for 47 years, having worked in medical centers, hospitals, and academic libraries. 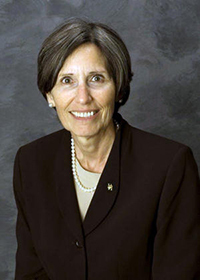 During her time at UH, she has served on numerous university, college, and library committees. Ferimer is a member of the Association of Vision Science Librarians, the Medical Library Association (MLA), and the Houston Health Science Librarians. She has published in both library and vision science journals, and presented at both library and optometry meetings. Ferimer was selected for membership in the MLA Academy of Health Information Professionals at the senior level in 2015. She was part of a group of vision science librarians who received the Louise Darling Medal from MLA in 2016, and in 2017 was presented the President’s Award for her service to MLA. The UH College of Optometry established a scholarship in her name in 2017. The following is a guest post by Julie Grob, UH Special Collections coordinator for instruction and curator of the Houston Hip Hop Research Collection. A Houston hip hop exhibit opens September 10 at UH Libraries. 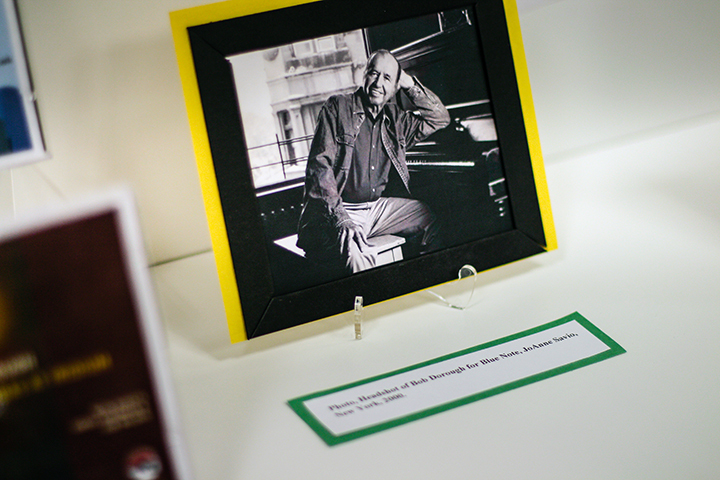 A new exhibit opens September 10 at University of Houston Libraries. 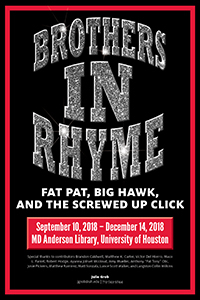 Twenty years after the death of the Houston rapper Fat Pat, Brothers in Rhyme: Fat Pat, Big Hawk, and the Screwed Up Click commemorates the lives and careers of brothers and fellow rappers Patrick “Fat Pat” Hawkins and the late John “HAWK” Hawkins. Both men were members of the Screwed Up Click, a collective of Houston-based rappers which formed around the late DJ Robert Earl Davis, Jr., better known as DJ Screw. The exhibit celebrates the enduring legacy of DJ Screw and the Screwed Up Click and their impact on fans and recording artists in Houston and around the world. In keeping with the collective nature of the Screwed Up Click, a variety of scholars, writers, and performing and visual artists were invited to contribute labels for the exhibit. Curator Julie Grob and UH Libraries would like to recognize Brandon Caldwell, Matthew K. Carter, Victor Del Hierro, Maco L. Faniel, Robert Hodge, Ayanna Jolivet Mccloud, Amy Mueller, Anthony “Fat Tony” Obi, Josie Pickens, Matthew Ramirez, Lance Scott Walker, and Langston Collin Wilkins. For information, contact Julie Grob. 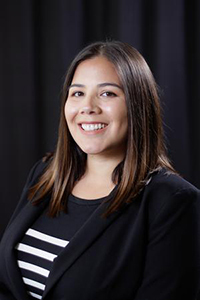 Ariana Santiago, open educational resources coordinator at University of Houston Libraries, has been selected as a fellow in the SPARC Open Education Leadership Program. The program is designed to empower library professionals with the knowledge and skills necessary to lead successful open education initiatives that benefit students. Santiago is one of 24 fellows chosen from a competitive pool for the program’s 2018 – 2019 cohort. The SPARC Open Education Leadership Program spans two semesters, beginning with an intensive online course in the fall to build comprehensive open education subject matter expertise. In the spring, Santiago will work with a mentor to implement a capstone project that will help advance open education at UH. Steve Campion of ABC 13 Eyewitness News stopped by University of Houston Libraries to interview university archivist and curator of the Performing and Visual Arts Research Collection Mary Manning and Janice Rubin, the Houston photojournalist who has recently donated 15,000 pieces of her photo archives to UH Special Collections. 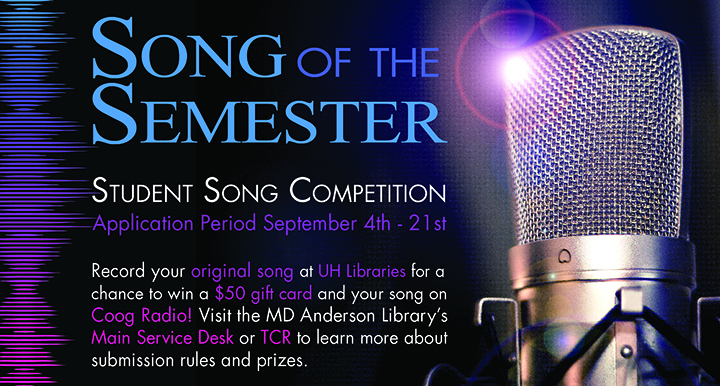 University of Houston students can record an original song for a chance to win UH Libraries’ fall 2018 student song competition. Song of the Semester applications will be accepted between September 4 – September 21, and audio submissions must be entered by November 15. Prizes of a $50 gift card and airplay of the winning song on Coog Radio will be awarded. One submission is allowed per contestant. All submissions must be original student works. No previously recorded material will be accepted. All submissions must be recorded using the UH Libraries Hamill Foundation Multimedia Studio. All submission forms must be received and approved by 11:59 p.m. on Friday, September 21. Contact the MD Anderson Library Service Desk or Technology Consultation Room for more information. Forms for consultation and song submission are available here. Learn more about the spring 2018 winners. The vision of the University of Houston Libraries is a community nurtured by curiosity and creativity that drives lifelong learning and scholarship. See why UH Libraries is a transformative place for everyone. 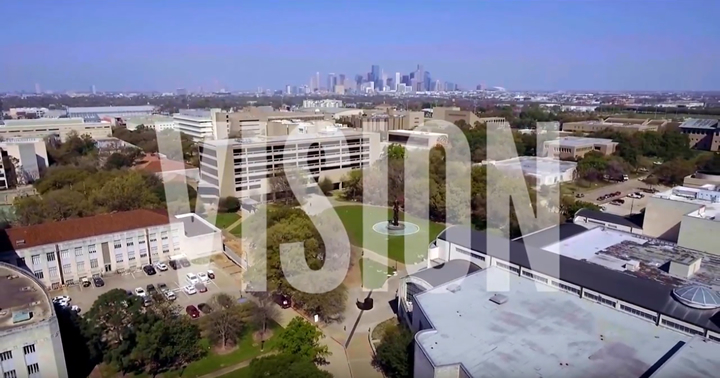 View the 2018 University of Houston Libraries video. 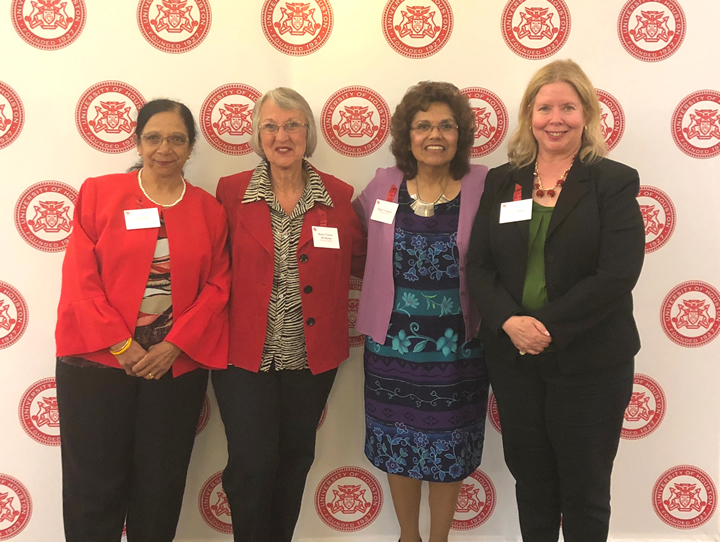 University of Houston Libraries staff were honored at the 2018 UH Staff Excellence Reception for service longevity. Dean of Libraries Lisa German (right) with UH Libraries staff recognized for service longevity at the UH Staff Excellence Reception. From left: Jyoti Vyas, Renee Fiorini-McManus, and Nelda Cervantes. Those honored were Jyoti Vyas (20 years); Alma Gallo (20 years); Nelda Cervantes (25 years); Richard Guajardo (30 years); Renee Fiorini-McManus (30 years); and Jack Hall (over 40 years). A University of Houston Libraries staff member was honored at the 2018 UH Staff Excellence Reception. A select group of University employees is honored each year through the President’s Excellence Awards. 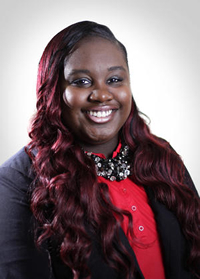 Shanequea White, UH Libraries department business administrator, won the 2018 President’s Excellence Award for Community Service. White, a UH alumna (BBA ’13) and longtime staff member, has been active in UH Staff Council for many years, and has contributed to the success of many campus-wide efforts, such as the Sock & Blanket Drive and the Spring Egg Hunt. Outside of UH, White is a member of Delta Sigma Theta Sorority, an organization whose purpose is to provide assistance and support through established programs in local communities throughout the world. In addition, White is pursuing her MBA at University of Houston-Downtown. White is dedicated to helping others. “Community service is very important to me,” she said. “It allows me to give back to individuals in need, as well as to UH and the Houston community.” With the President’s Excellence Award, she is proud to continue her family’s legacy in both UH service and volunteerism. Her mother, grandmother, and aunt also attended UH and were longtime UH staff members, and are active in community service efforts as well. View photos from the 2018 UH Staff Excellence Reception. University of Houston Libraries is pleased to host a viewing of the documentary, Jesse Lott: Art and Activism, on Thursday, September 13, at the Bert F. Winston Band Complex, E137 Rehearsal Room. 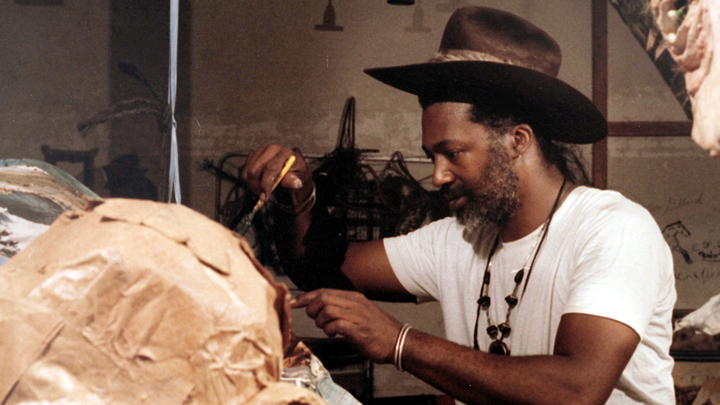 Lott is an influential African American artist known for “visionary wire sculpture, paper figures, and works on paper made using found materials.” He is one of the founders of Project Row Houses. The film follows Lott as he prepares for his 2016 show at Art League Houston where he was presented the Lifetime Achievement Award by his childhood friend, Mel Chin. The filmmaker, Cressandra Thibodeaux, is an award-winning director and artist. She is the executive director of 14 Pews. The event will begin with a reception at 6:30 p.m. with the documentary showtime at 7 p.m. A conversation with Lott and Thibodeaux will follow, along with a sculpture demonstration by the artist. Light refreshments will be served. The event is free and open to the public, and registration is required. The building address is 3700 Cullen. $5 parking is available in the Stadium Garage on Holman.